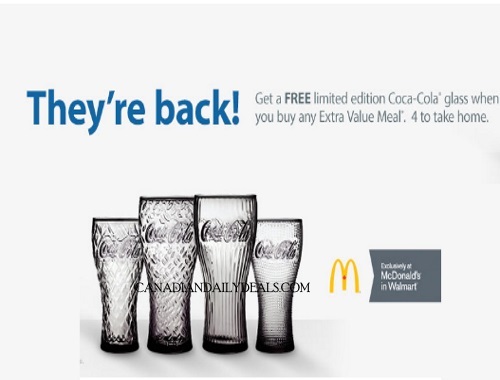 Canadian Daily Deals: Mcdonalds Free Coke Glasses are Back! Mcdonalds Free Coke Glasses are Back! Free Coke Glasses are back at Mcdonalds Walmarts! Get a Free Coke Glass when you purchase any Extra Value Meal at participating Mcdonalds in Walmart locations! There are 4 different glass designs to collect. Offer while quantities last. Click on the link to find a Walmart location near you that has these available!